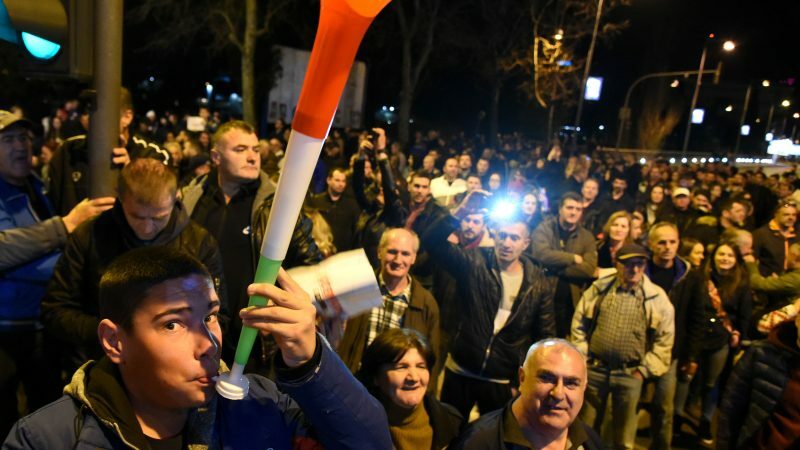 Thousands protested in Montenegro’s capital Podgorica on Saturday (2 February), the fourth such rally in as many weeks, demanding that President Milo Djukanović and his government resign over alleged corruption, cronyism and abuse of office. Throngs of people, rallied by civic activists, bloggers and journalists who say they are not affiliated with political parties, marched through the center of the city chanting “Milo thief”. Opposition politicians have distanced themselves from the protests. Weekly political protests also continued in Serbia, Montenegro’s larger neighbor and fellow ex-Yugoslav republic. Marija Backović, a teacher from Podgorica, said she was protesting for a better Montenegro. “We are not the danger for this country … those that are destroying it for 30 years are the real danger,” she told the crowd on Saturday. The rallies started after Duško Knežević, a former ally of Djukanović, accused him and his ruling Democratic Party of Socialists (DPS) of corruption, cronyism, abuse of office and murky financial deals. Both Djukanović and the DPS have denied the allegations and said the protests are legitimate unless they turn violent. Djukanović has dominated national politics in the small Adriatic country, a NATO member and candidate for European Union membership, serving as prime minister or president for most of the period since independence in 1991. Montenegrin prosecutors accused Knežević, a banker, of fraud and money laundering, but he fled to Britain. He has said he will produce more evidence about alleged murky dealings by Djukanović and his allies. In December, Montenegro’s central bank placed the small Atlas Banka, headed by Knežević, under temporary administration as its capital failed to meet minimum risk requirements. In January, Atlas Banka sought to increase its capital again after hiking it last October by 1.37 million euros ($1.56 million) to 32.03 million euros. In Serbia’s capital Belgrade, meanwhile, thousands marched in protest at what they see as the increasingly autocratic rule of President Aleksandar Vučić. The veteran leader and his ruling Serbian Progressive Party (SNS) are accused by political opponents of stifling media freedoms and opposition parties have demanded Vučić’s resignation and establishing conditions for free and fair elections. Tonight’s anti-govt protest in Belgrade was the 13th straight weekend of demonstrations. Vučić and the SNS, which with coalition allies holds a comfortable majority of 160 deputies in the 250-seat parliament, reject those allegations. Both Montenegro and Serbia are seeking join the European Union but have been told they must root out organized crime, corruption and nepotism and reduce bureaucracy before they can become members of the bloc.